Still handbuilt from wood for loud sky filling resonance and true tones. Alan writes... It's twenty odd years now since I built my first Call. I built it because I wasn't satisfied with the calls that were available at that time and I built it from wood. I still build them from wood. The fact is I am as bloody minded about the ultimate pulling power of wood as I ever was. Yep life would be easier if I used other methods for making my calls. But it is the guy that tells me that despite the new high end call he adds to his lanyard each year and despite a lanyard full of very good calls he still has one of mine in his hand by 8 o'clock. He doesn't know why. I do. Larger Speaker: 75mm 15 volume control levels Volume Output: 120+ decibels (no need for 8 watt Amp) Two x Interchangeable sound cards slots = 10 recordings Operates on 4 x AA batteries for extra longevity (not supplied) Alternative DC 6-12V DC power socket New STOP button design: features STOP/PAUSE. Note: Uses the same Wireless Remote and Yellow labelled sound cards as the current model Caller for easier upgrade. Wireless remotes can be purchased at a later date, if one decides it is needed. This deluxe model has 2 sound card slots NB: Game Caller does not include a sound card. All cards sold separately. Let your fingers do the talking with the all-new mini Phantom Digital Call. 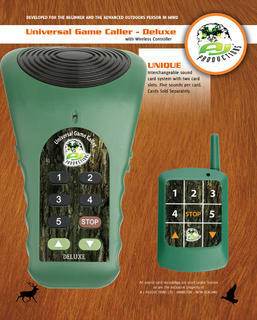 This call is chock full of advanced features not normally found in an affordable compact call. The mini Phantom is the smallest call in its class, with undistorted 8-bit sound quality and up to 110db of volume. And of course, it can play two sounds simultaneously and overlap the same sound. The mini Phantom is the size of a flashlight with a built-in, forward facing speaker, and boasts interchangeable Sound Sticks. Each Sound Stick holds 5 sounds and even has a Mute button. 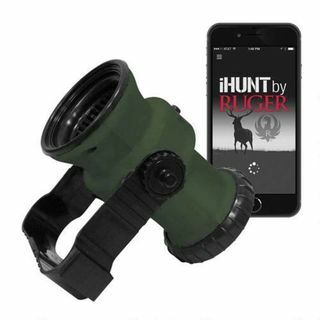 A key benefit with the wireless remote when hunting/filming or photographing animals, they will always come direct to the source of the sound. By placing the main hand unit at a distance, this will enable you a better look at the approaching animals. This is also a great SAFETY feature. 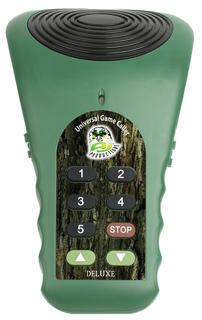 This deluxe model has 2 sound card slots NB: Game Caller does not include a sound card. All cards sold separately.